Rob: Welcome back to our Becoming Your Best podcast listeners. This is Rob Shallenberger, your host and I will be with you for a few minutes to have a conversation about some things that I’ve been thinking about recently and my different travels and ventures and meetings with different people around the United States and I hope these thoughts will be helpful to you. They’re very powerful when they’re applied to our lives and our businesses. We’re going to get right into this, we’re probably not going to take too long, maybe 15 minutes. So if you’re in a drive or in a car driving to work or driving to a location, that should be about perfect timing for your drive. 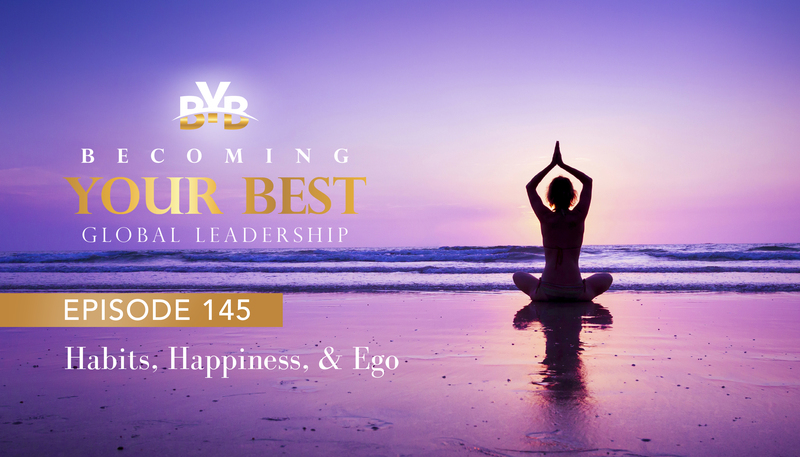 There are three things that I want to focus on this podcast; habits, happiness and ego and how those three intertwine with each other. So let’s start first of all with habits. You know, so much of our success or failure or happiness or misery in life revolves around our habits. These are our daily habits that really govern how we lead our life. One of the reasons I was thinking about habits specifically is I was reflecting on about a year ago an experience I had in Maui where I was doing a keynote for an incredible organization called A Place For Mom. I know quite a few listeners will be from A Place For Mom. Fabulous organization, I love this group and this was their top performers retreat. So while I was out there doing their keynote, I took my daughter Bella with me and I tried to do this with each one of my kids throughout the year and take them to one or two, what I would consider to be cool locations and Maui certainly fit that bill. So while we’re there, being there a day early, I took Bella scuba diving for her first time ever. It was kind of a cool experience because here we go out there, she’s 13 years old and we’re in a group of about five people with a private guide. It’s a beach excursion, which means we walk out from the beach and then just start scuba diving right from there. There’s no waves so it’s fairly easy to get out and then just go out maybe 100 yards from the shore and it’s 20 to 30 feet deep and so you’re staying fairly shallow as scuba diving goes. So we’re out there, and they gave you this crash course on how to scuba dive. Now I’m certified but this is Bella’s first time ever scuba diving as it is for the rest of the people in the group. So we’re sitting out there offshore, where it’s about five to six feet deep, you can still stand up. The instructor is going through some things that each person needs to know that are critical just to make sure that they can survive. Just the big need to know things. One of those is how to breathe underwater and how do you use this device that keeps you afloat or helps you to sink when you want to go down. Part of this is how to breathe. So he works with my daughter Bella for about a minute or two, shows her how to do it. And after one or two tries, she’s got it and she’s done. He said, “All right, you’re ready to go,” and I thought that was fast. Nonetheless, she looked like she was all set. Then the next person in line that he was going to help was about a 60-year-old gentleman. I don’t know who this person was, it’s the first time we’d ever met and he starts working with him on this breathing technique and how to put on the mask and take off the mask. Well after like five or six tries, he’s still not getting it and the instructor you can tell is starting to get a little bit flustered. So again, he repeats it. He’s very patient and over and over they practice and literally this is taking now more than 20 to 25 minutes. So we’re all just sitting there watching, and this gentleman just cannot get it, this breathing habit. I’ll never forget what the instructor said, finally after he got close enough to where the instructor felt like he could pass him off he said, all right good enough. He looked over at me and he said something interesting. He said, “I love working with kids because they pick it up so fast.” He said, the worst people are those that are in their 50s and 60s, because they have such strong habit patterns that for them to learn this skill is really difficult. I thought that’s actually much more profound than he may have realized it was. And as I started reflecting on our habits, there’s a thought that comes to mind, the more deeply ingrained a habit, the more difficult it can be to change it. That’s one of the reasons why kids are so great because they can pick something up on a dime and learn it. They’re so moldable, they’re so teachable and so humble at their young age. And yet, sometimes as we go throughout life we get so deeply ingrained in these habits that they can be very, very difficult to break, let alone picking up a new habit and yet it’s these very habits that will determine our long term success and happiness regardless of our age. So here’s an example of what we’re talking about, pre-week planning. If you are a podcast listener, you probably know what pre-week planning is. You’ve either attended a seminar, you’ve watched one of our videos, somewhere along the line you’ve probably been introduced to pre-week planning. We all know what a powerful habit it is to really sit down on Saturday or Sunday and take 20 to 40 minutes to schedule our priorities rather than prioritize our schedule. So that’s why we always would say that becoming your best is both a mindset and a skill set. Pre-week planning is the skill set, yet it’s the mindset and the willingness to do pre-week planning and the discipline to follow through week after week and month after month and actually make that habit, an integrated part of our lives and that’s when it becomes a powerful tool and skill set. So with pre-week planning, how many of us have had good intentions and then it just tends to slip through the cracks? One of the things that I’ve found is that when pre-week planning slips through the cracks, it’s generally not an intention issue. You know, we have good intentions to do things, it’s just a matter of we forget or we say, oh dang I just didn’t do that. Here’s an example of that. I do some things in the stock market and so I’m supposed to check a particular chart every day at 11:23 a.m. Mountain Time. Well, for quite a while there, it would be 1, 2, 3 o’ clock in the afternoon, I would say to myself, “Oh, I forgot to check the charts.” That had nothing to do with intention. My intention was right. It was there, it just wasn’t a part of my habits. So to help with that, I started setting a trigger in my phone. In other words, an alarm on my phone at 11:23 a.m. Mountain Time, and in the text of the alarm I would write, “Check the 233 chart.” Suddenly, every day that alarm would go off at 11:23, it started to become a habit. Now, I still have that alarm every day because I know they’re going to be days when I get busy and I’m just going to simply forget to look at the charts. It’s that trigger that keeps me focused. So using pre-week planning is the example of the habit that we’re talking about right now, what I would invite you to do is set a trigger on your phone. In other words an alarm for Sunday morning and Sunday evening and use that trigger, that alarm to be a reminder. So write in the text “Pre-week planning” and when it goes off you say, “Oh that’s right, I need to do this.” So the morning of the check to say, “All right, if I haven’t done pre-week planning yet, today’s the day.” The reason you set the second alarm, Sunday evening, is that’s your last chance to do it. Now, if a person hears all the alarms and they still choose not to do it, it’s no longer an intention issue, now it’s a discipline issue, which is a separate discussion. So that is a powerful way to help develop a habit in our lives and I would invite you to consider doing that with pre-week planning and any other important habits that you’re trying to develop or build. So if you’re trying to be more complimentary towards others or do more random acts of kindness or whatever the habit might be that you’re trying to develop, consider setting a trigger or an alarm in your phone to help remind you so that there’s a connect between the intention and the reality. That’s number one. Number two is this thought on happiness. I just watched a video yesterday that really tied into this thought and it’s materialism versus happiness. I drive every day up and down the canyon to and from our office, it’s about a 30 minute drive. So on that drive, I have a lot of chance and time to reflect and think about things. So this is something I’ve been thinking a lot about. I had a chance to serve a two year service mission in Bolivia, which happens to be the poorest country in South America. We’re building and working on building right now, and over the course of the next year, we’re really confident that this is going to come to fruition and have a big impact. We’re working on establishing a Rwanda Leadership and Entrepreneur Institute to help this rising generation in Rwanda. We have an Africa tour set up that’s going to be happening in about a month where our top international presenter will be teaching organizations around Africa, the same in India, Vietnam. I’ll be in Guatemala next month. In all these different countries where maybe there’s not as much material or things, there, in many of them, seems to be a higher level of happiness. In other words, the rate of depression in the United States has gone up by three times over the last 20 years and you think, well, that’s directly opposite of what’s happened to our ease of life around us. We live in a world right now where things have never been “easier.” We have everything at our fingertips with air conditioning and phones and cars and all of these things at our fingertips yet why has our happiness gone down as a whole. That should cause all of us to really think. Part of it is this materialism versus happiness. As we look at our lives, how focused are we? What is our driver? What is our internal driver and if it is more material, if it is more money. There’s certainly a lot of good things we can do with money. So that’s not the implication here that I’m trying to paint. What I’m trying to say, if that is our sole focus, the love of the money, the material, and as it was said yesterday, to buy something that no one even cares if we have anyway. If that’s our focus, it’s just an unquenchable thirst. It’s a thirst that can’t be satisfied. The thing is, many times if that becomes our quest and our journey, we’re not even going to be able to realize that it’s happening around us. It’s kind of like the frog. We all are familiar with that analogy where, you know, you put the frog in the warm water, you turn up the water and it slowly gets warmer and warmer until it’s boiling and it kills the frog. What’s the temperature of the water around us? In other words, where is our focus truly? And let’s come back to pre-week planning. If our vision and if our goals and if our pre-week planning are not a part of our habits, then what is driving us? What is our focus and where is our use of time and what’s happening with it? We each have 1440 minutes in a day. Do our daily and weekly actions align with our long term vision? If not, if our current reality is not aligned with our long term vision, there will be a disconnect, and it’s hard to be happy when there’s a disconnect between our current reality our weekly actions and our long term vision. So speaking of materialism, why is it the in Bolivia this group of kids can be so happy out there kicking a can with bare feet yet we can be so dissatisfied sitting on a nice carpeted living room with a beautiful couch and a cell phone in our hand. So I would just invite you to consider where the source of happiness is in your life right now. Where are you spending most of your time, your thoughts, your energy? Is it going towards the things that matter most, that you can really take with you or is it towards this materialism and these things that we can’t even take with us? So think about that one. Habits, happiness. And the last one ties partly into that, which is ego. This actually emanated from a discussion that I had sitting in a car with someone a few months ago and he asked, “What is one of the greatest impediments to the success of a leader?” Now, let me put two asterisks and caveats next to my answer here and I’ll explain why. My response to him was ego. Now, we all have ego, so I’m not saying necessarily that ego in and of itself, it’s a bad thing. It’s how we handle that ego that can be one of the greatest impediments to our success. So let me explain what I mean by that caveat. There is a difference between confidence and ego and there’s a difference between having the ego that is something we can’t set aside and it’s a hindrance to our success versus someone who can set that aside and be humble enough and willing enough to learn and invest in themselves and grow, and realize there’s still things out there that they don’t have, that they don’t know. So let me give you an example. In the fighter pilot world, there’s a big difference between a fighter pilot who is confident versus one who has an inflated ego. The one who’s confident is the one I want to fly with. They’re very confident in their abilities, they’re confident in their experience and their practice. They’re very confident in the jet. Hey you know what, the maintainers have done a great job. It says it’s signed off, I have a high level of confidence and they can go out and execute the mission very well. That’s the kind of person that I love flying with because I know they will generally make smart decisions based on their practice, their repetition. The person that is the, I’ll just say the scariest person to fly with is the one who has the inflated ego, who can’t be wrong, because they’re the ones who will make dangerous decisions because it can’t be them that’s making the mistake. It’s surely got to be someone else. How are we in our business lives? How are we in our personal lives? Are we confident enough to move forward? Because that comes from repetition and practice? Or do we have a strong enough ego to where it’s got to be someone else that is responsible for this because it couldn’t have been us? That’s the dangerous ego that I’m talking about. So yes, we can be very successful financially and in all these other areas and say, you know what, yeah, there’s an ego that comes with that. However, if that ego impairs our ability to say, you know what, I was wrong in that or how could I do better? Then that’s when it becomes dangerous to us. That’s why one of the things I’ve seen in the best leaders that I’ve interacted with around the world is they have a level of humility enough to set aside their ego when they need to and say, you know what, how can I do that better whether it’s being a spouse or a leader or running their organization. Let me just give you one example of this. The CEO of Blockbuster back in 2008 said neither Netflix nor Redbox is even on our radar in terms of competition. Now that ego filled statement and not being willing to take advice and suggestions from those around him, that caused his company to file bankruptcy a year and a half later and the people that caused that bankruptcy were the very two companies who said he weren’t even on their radar in 2008. Ego got in the way of his success in that particular case and it cost the entire company. So how do we approach our lives where we’re humble enough to say you know what, how can I do better? Are we investing in ourselves because here’s the thing, it’s not what we don’t know, it’s what we don’t know that we don’t know that should keep us up. In the F16 they have a warning and a caution light. The caution lights are yellow, the warning lights are red. The warning lights are bad. If you see a warning light, it means there’s something impending that could very easily cost you your life. For example, an impending engine failure. If you see an oil light on that means, you know, you may have 5 to 20 minutes left of the engine running. So a warning light is something you want to react and respond to right now. And in my internal, I’ll call it warning and caution light or panel, there are a few words that I’m always listening for. If I ever find myself saying these words, I hear in the back of my mind what I hear in the F16 when that warning light goes off, and you hear a voice in your headset that says, “Warning! Warning!” These are the two or three words or some variation of them that always will get my attention. It’s this, “I’m fine the way I am. I already have a system that works, I don’t need something else. I’m good to go.” Any of those type of comments, think about what they’re doing to our progress. We just capped our progress because how in the world can we get better, let alone to our best if we’re satisfied with where we are today. And the only reason someone would generally make those comments is when ego gets in the way and we’re not humble enough to say, “You know what, maybe there’s something else out there that I haven’t considered. Maybe there is a better way to do that.” When we have the ability to set aside that ego and ask it in a humble way, man we set ourselves up for great success to develop the right habits and ultimately, really be happy in the long run because we’re growing and developing. So I hope this has been helpful for you. Habits, set a trigger for the right habits. Happiness, focus on the things that truly will bring happiness and not the materialism that provides a temporary fix is not the true source of happiness. Last is ego. The ability to set aside our ego in a humble way and ask, how can we do better in the various roles of our life? This is the spirit of becoming your best. It’s the mindset, it’s the way great leaders think. This is a journey. You know, as you think about becoming your best, it’s kind of like hiking a mountain. How many have ever hiked a mountain, large or small, it doesn’t matter? Isn’t it true for most of us that when we’re hiking up a mountain, we walk up the first few hundred feet and we suddenly get a view of the valley that we hadn’t seen before and we say, “Oh, this is amazing.” And we pull out the camera and we start taking pictures. And then we hike a few hundred feet higher and it’s an entirely new vista that opens up and we say, “Oh man, this is so much better than the first,” we take more pictures. That scenario repeats itself all the way until the summit when you get to this incredible view where you can see for miles and miles around you. That’s kind of like what this journey of becoming your best is all about. If we start focusing and forming the right habits, we start to realize this unlimited potential that exists within us. Our happiness really starts to change that we’re truly happy. For some people, it’s the first time ever in their lives, that they will say that they are truly happy and it’s the setting aside of our ego and this willingness to try new things that ultimately will open up that pathway to go from vista to vista to vista and open up entirely new views in our lifetime. So thanks for joining us on this podcast. We appreciate you, you are amazing. It would be so fun if we could all see each other and who’s actually listening and the ripple effect of the people who participate in these podcasts because you are all over the world and I’m in awe of the things that you are doing on a daily basis. So this is Rob Shallenberger wishing you a fabulous day. As a brief reminder, if you have not taken the personal productivity assessment yet, go to the website becomingyourbest.com, take the assessment. It takes about five minutes. It’s 25 questions. It’s a very strong predictor of your long term success and can help point you in the ways that will help you with some of the things we’ve been talking about on this podcast. So Rob Shallenberger wishing you a fabulous day and a great week! Announcer: Thank you for listening. Would you like help to apply the 12 principles of highly successful leaders in your life, in your family or in your organization? Call us today at 888-690-8764 to speak with a helpful representative to evaluate your situation and how we can help. Or you can visit becomingyourbest.com. Whether it’s a corporate training event, keynote, workshop, trainer certification or personal coaching, it would be our pleasure to serve your needs. Once again, call 888-690-8764 or visit becomingyourbest.com today.